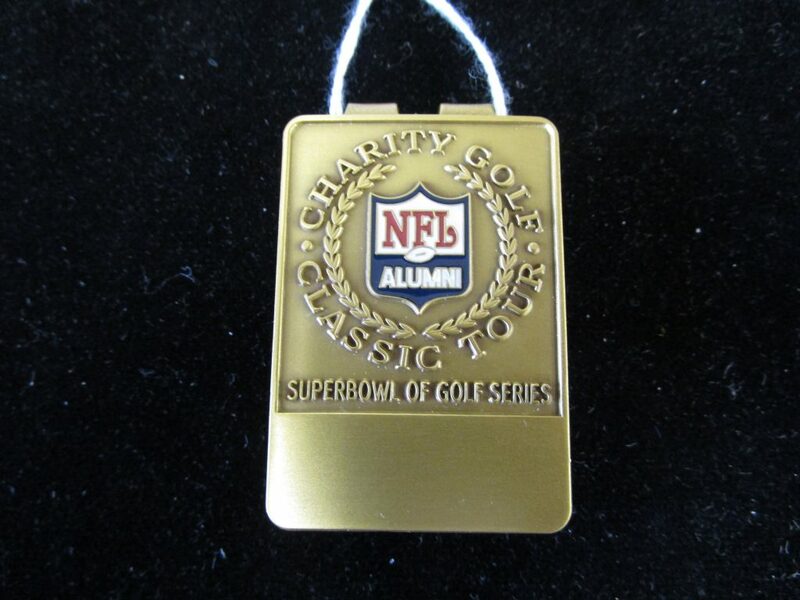 We are offering this NFL Alumni Charity Golf Classic Tour Brass or Gold Tone Money Clip. 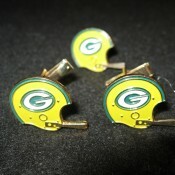 It measures 1 3/4″ by 1 1/4″ and is in Mint Unused Condition. 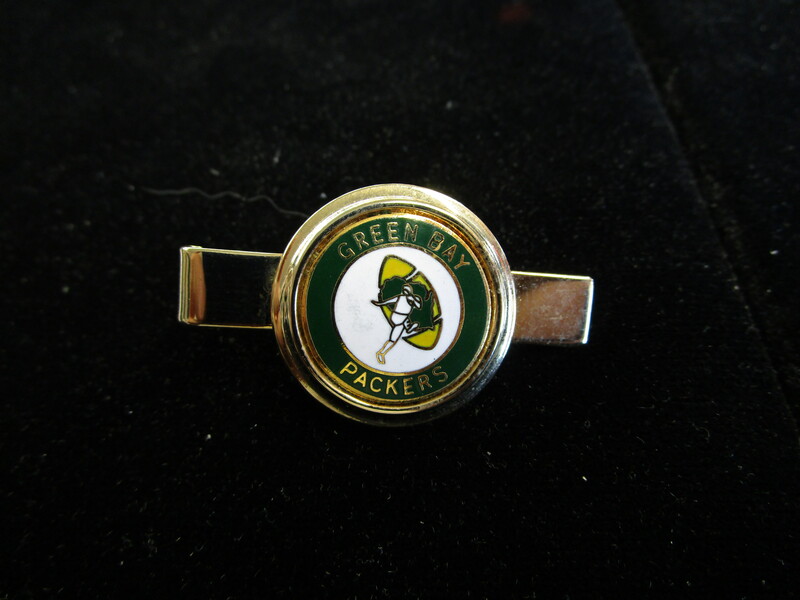 This came from the estate of Green Bay Packers Hall of Fame Member John Martinkovic. 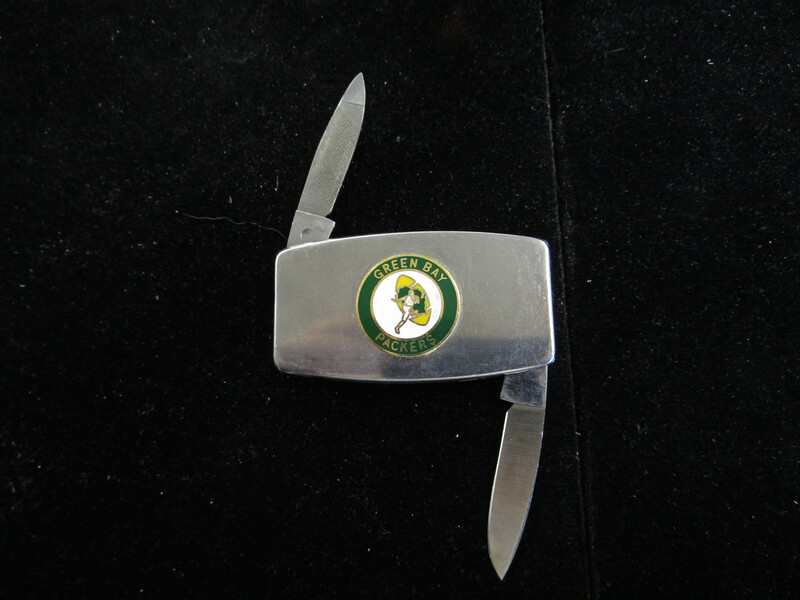 Here is a Vintage 1960s Stainless Steel Japan Double Pocket Knife and File Combo with Green Bay Packers “Back On Map” Logo button applied to one side. 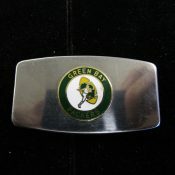 Reverse side has advertising from a Green Bay Business who were regular advertisers in the programs. 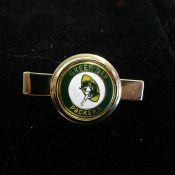 This item came from a relative of the founder of the company who was also a Packers Board Member from 1931-1985. Excellent Condition. 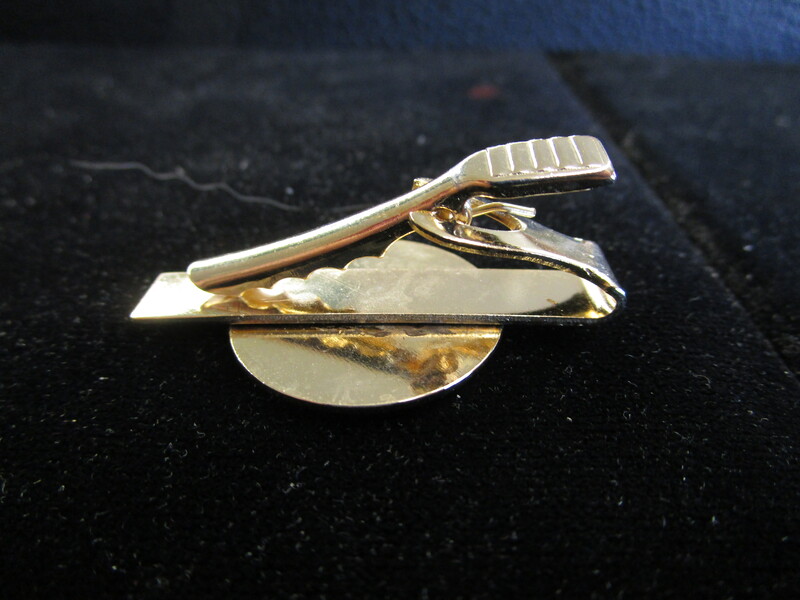 It measures 2″ long in the closed position. 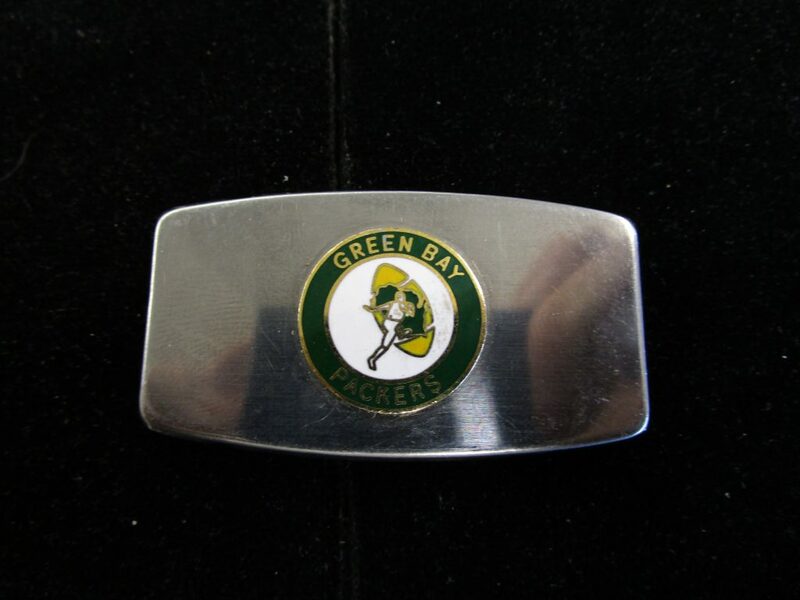 WE are offering this Scarce Circa 1960s Gold Tone Tie Bar with Green Bay Packers “Back On Map” Enamel Logo. 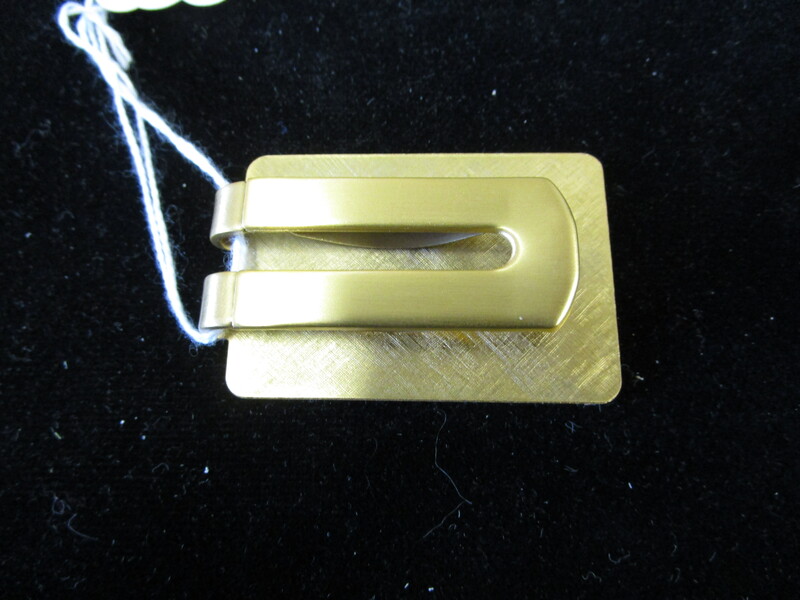 Bar measures 1 5/8″ long and has alligator style clip. 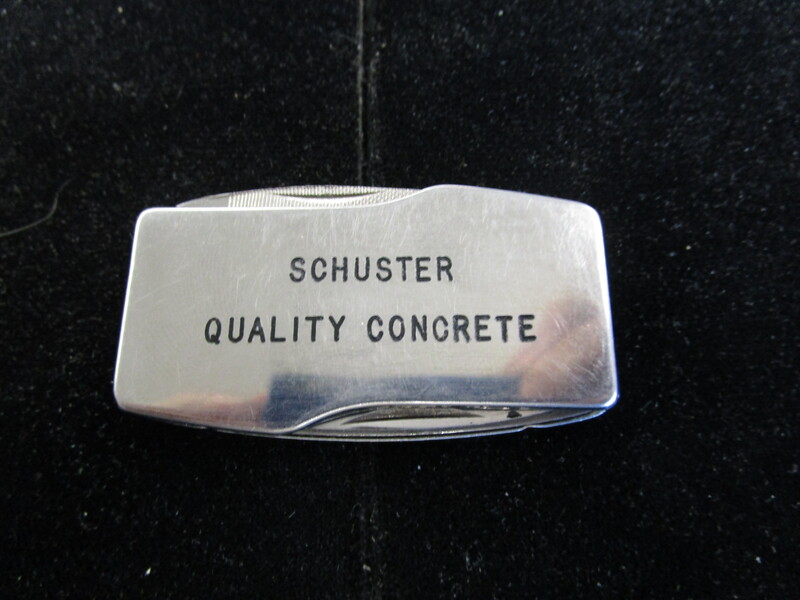 Excellent Clean Condition-probably unused. 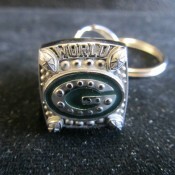 Every Packer Fan Will Love this Super Bowl 45 Combination Ring and Key Chain. 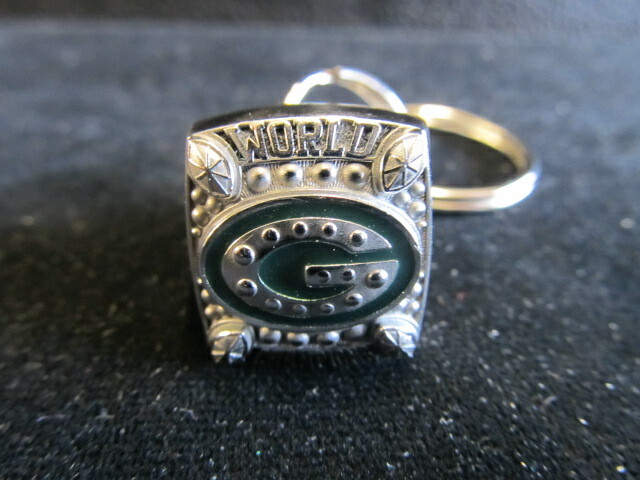 Highly Polished Stainless Steel Ring with Green Enamel “G” Logo. 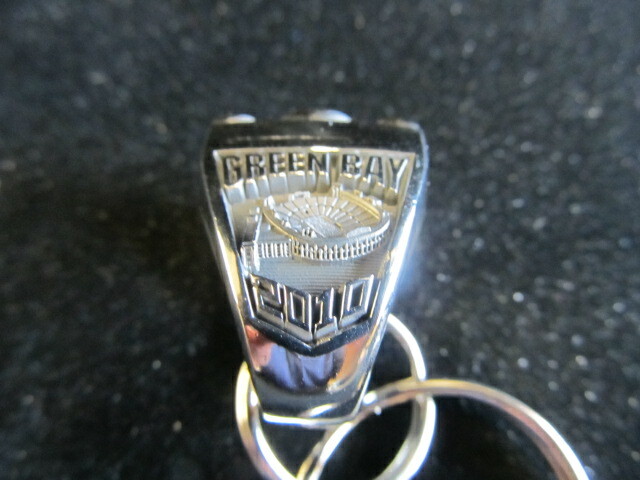 Side scenes of Lambeau Field and Lombardi Trophy. 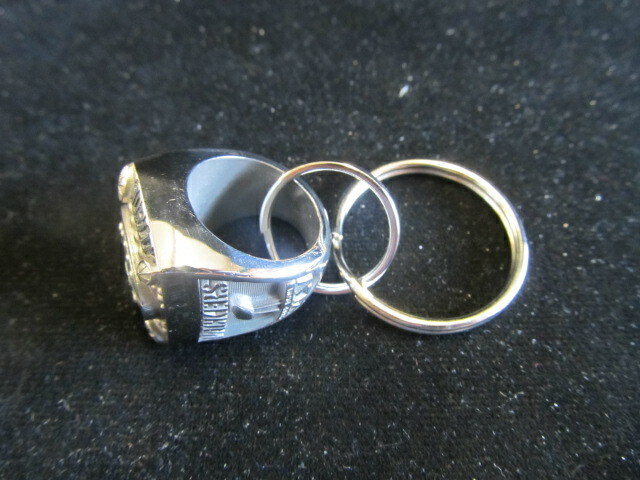 The ring is detachable and could be worn. 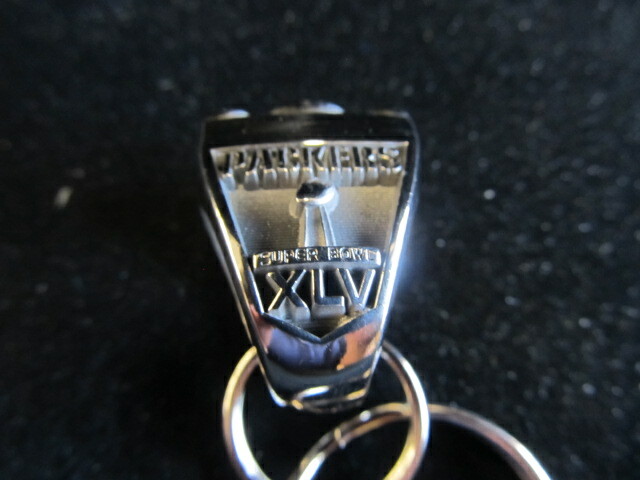 Ring is Size 5. 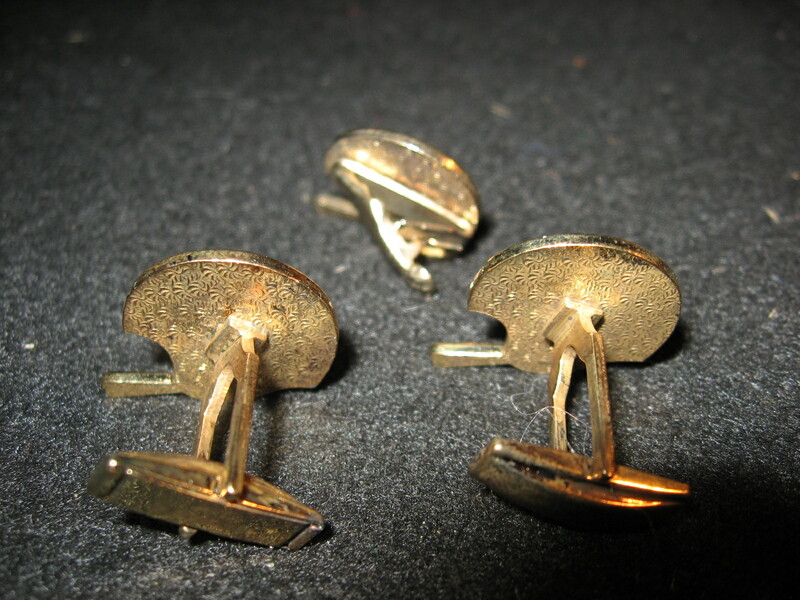 This is a New Stock Item. Green Bay Packers Helmet Cuff Links & Matching Tie Tac Circa 1970. 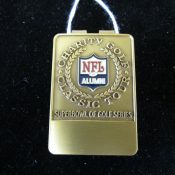 Gold Finished Metal With Green & Gold Cloisonne Enamel. 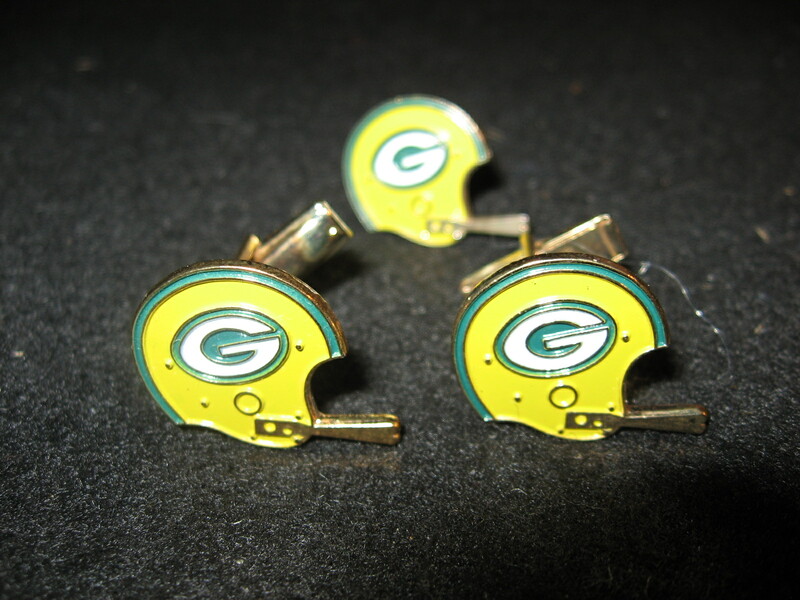 Helmets Measure 3/4″ Across. Excellent Detail & Design. As New.